If on Wednesday (21st August) you found you passage to Waitrose blocked at Hampton Road there was a legitimate reason for this. The residents of Hampton Road held ‘Playing Out’ afternoon which meant closing the road to traffic from 3 to 6pm so residents and children could enjoy some car free playing in the street time. Hampton, one in the middle of Hampton Road as this was the end of the restriction and also one at the end where it meets Balmoral to stop people coming down and realising that they couldn't go any further. People were also stationed at each end to explain the situation to some of the more enthusiastic drivers who were keen to plough on regardless. 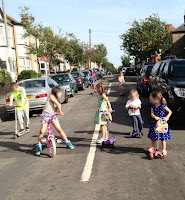 The 20 or so children played in the street on their scooters and bikes; they played with a swing ball, had races up and down, played a sort of piggy in the middle game and generally enjoyed the space as children do. When they got tired or hot the adults suggested other ways of entertaining themselves but the kids ultimately decided themselves what they wanted to do. The adults stood by and supervised (making sure they didn't overshoot down the hill into Windsor Road!) The older neighbours enjoyed a cuppa and a slice of cake on the side and one or two of the newer residents came out to say hello. The ‘Playing Out’scheme started in Bristol in 2009 and the idea is to give children the freedom to ‘reclaim’ the streets. 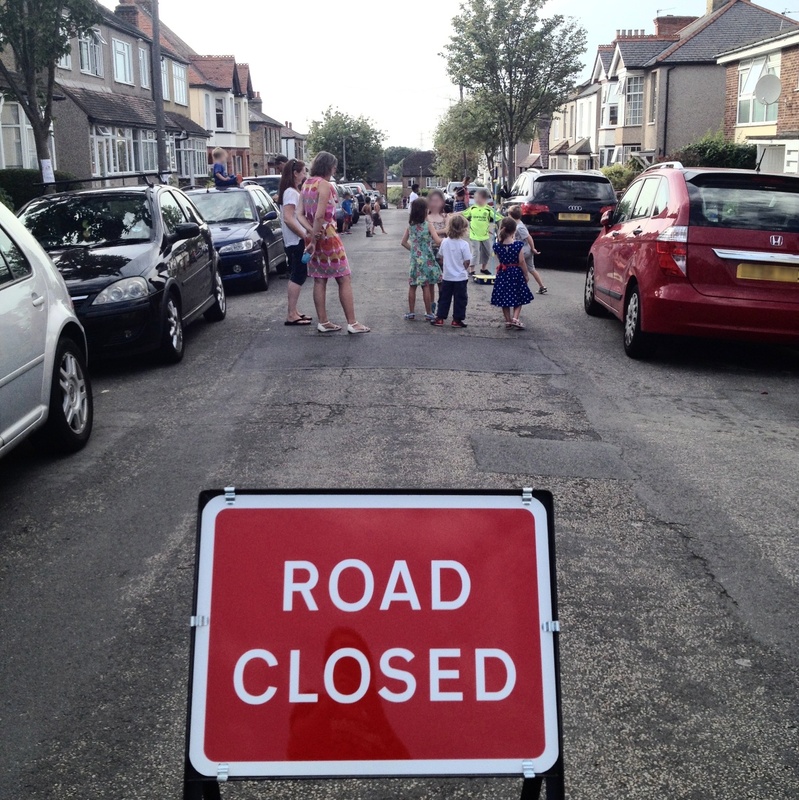 It doesn’t necessarily need to be an organised event like with a street party. The Scheme only runs from June to September and you need to apply to the council six weeks in advance in order to close your road from a maximum of 3 hours. “In order to apply you need to seek out neighbours opinions, which I did with a letter through each door (all 70+ of them). I had already spoken to 3-4 of my neighbours who had offered to help. So we got a date that suited us and advised the other neighbours that this was the date we were looking to apply for, they then had two weeks to consider and raise any questions/concerns and the first point of call was me. I did not get any negative responses from any neighbours, they were all keen and enthusiastic. The application was then sent off to Sutton Council telling them if there were any objections that I knew of - which there weren't. Once permission was granted, Sutton Council provided me with an email notice that had to be put up at the end of the road two weeks prior to the event. I also put up my own notices on Monday along the part of the road (I only cut off half of Hampton) for people I thought would park who were not residents, hoping that they might consider parking elsewhere so as not to have to drive out later. We chose the summer holidays because we thought it would have less impact on traffic. It went down really well with the neighbours, young and old in our road, not so well with the cut through drivers however three hours isn't a life time and I am sure they will get over it. Hampton Road is a particularly busy "cut through" when Central Road is clogged up with traffic however we didn't think it too much to ask if the cars could go down another road temporarily. 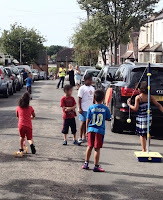 There was a great atmosphere, the kids had a ball and some of the more mature neighbours enjoyed sharing some time chatting (drinking tea) and getting together which they might not otherwise get a chance to. I think the sunshine helped a lot. Highly recommend applying to Sutton Council under the playing out scheme. It brings back a certain nostalgia of the good old days when kids could kick a ball about in the street without fear of being run over by an 80 mph rat runner. Apparently Councils (including Sutton) are rather keen on the idea particularly after last year’s successful street parties. Guidance notes from Sutton for holding a playing out event can be found here. 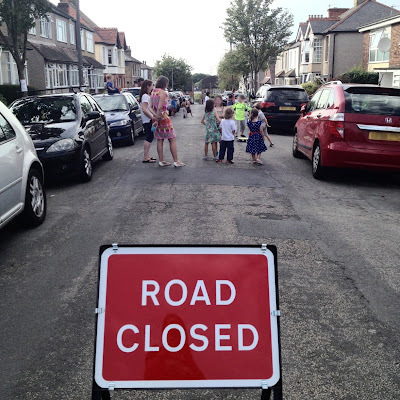 The blog understands that at least two other roads have been closed off in Sutton this year for similar things.